Events leading to the establishment of Salem's oldest cemetery are so closely linked to the history of the Methodist Church in Oregon that it is difficult to separate one from the other. In 1834 Jason Lee and four associates were sent west by the Mission Board to establish a mission to the Indians in Oregon Territory. After three years of work in the field they were joined by a party of reinforcements that included Anna Maria Pittman. Within 2 months of her arrival, Anna Maria and Jason Lee were joined in marriage. Sadly, the marriage was to end with the untimely death of Anna Maria. Following the difficult birth of a son in June of 1838, she and the baby died and were buried in a single grave at the Methodist Mission. The mission carpenter provided a home-made casket. At the time of her death, Jason Lee was enroute east to procure more help for the mission. A messenger was sent to advise him of his loss. With a heavy heart he continued on his journey, returning in 1840 with what is now known as the "Great Reinforcement" of the Methodist Mission. A total of fifty-two individuals arrived in the Oregon country, escorted by Jason Lee and his new wife, Lucy Thompson. Because of the swampy, unhealthful conditions at the Mission on the Willamette, it was decided to relocate the Mission and the proposed Indian Manual Training School to a site at what is now 960 Broadway in downtown Salem. Here a creek with adequate water to run the lumber and grist mills was available. At this location in 1841, Jason and Lucy Lee moved into one of four apartments in the first frame building in Salem, with the Judsons, Parrishes and Raymonds as neighbors. See also: Methodist Missionary Society land records. Lucy Thompson died March 20, 1842, a little over two years after her marriage to Jason Lee. She was described as a woman of rare moral and intellectual endowment, finely educated. Her illness was brief. She died in the arms of her husband, leaving to his care an infant daughter, then but three weeks old, whom he named Lucy Anna Marie, after both his wives. She was buried at the site of the current cemetery on D street in NE Salem, and within a short period of time, Anna Marie Pittman Lee and her infant son were moved to the new location. Although the date on the iron gate at the entrance to the cemetery is noted as 1838, the date of Anna Marie's death, the first known burial at this site was that of Lucy Thompson in 1842. As the cemetery became well established, the bodies of many early missionaries and pioneers were exhumed from the Cemetery on "French Prairie" and from the one on Mill Creek, near the site of the Jason Lee House, and re-interred in Lee Mission Cemetery. In 1843, Jason Lee once again journeyed east to address the Mission Board. Letters critical of his leadership had been sent and he wanted to plead his case. Unfortunately, he was too late and a decision to disband the mission had already been put into place. He continued on to his home in Stanstead, Canada where he died shortly before his birthday in 1845. In January 1869, Elizabeth Winn Parrish, wife of Josiah L. Parrish donated 4.77 acres from her half of their original donation land claim to make up the original part of Lee Mission cemetery. 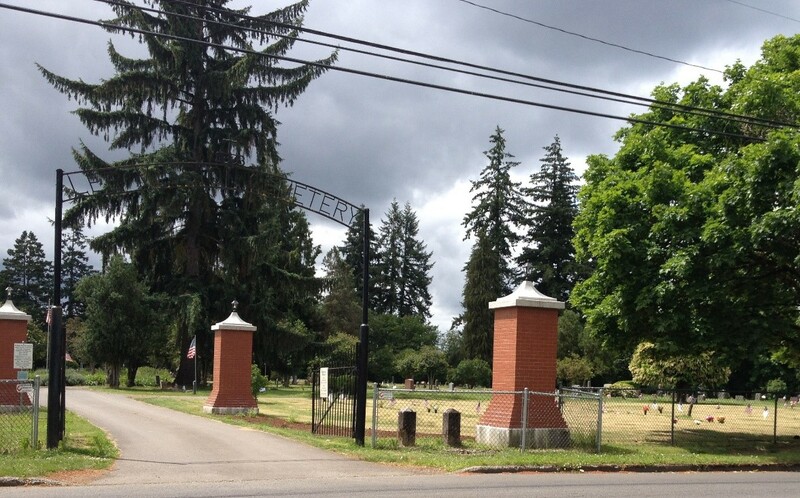 The cemetery was then incorporated by the state of Oregon Jan 27, 1869, the incorporators being Charles Craft, Rev. I.D. Driver and Rev. J.L. Parrish. An additional 6.5 acres was deeded August 29, 1887, to the cemetery from the Board of Directors of the Oregon State Insane Asylum for $50.00. Three years later, on November 24, 1890, an additional 4.40 acres was deeded to the cemetery from Lavina Patty, widow of Rev. W.R. Patty. In the early 1900s an effort was begun to bring the remains of Rev. Jason Lee back to Oregon to be buried beside his family and mission associates. His remains were re-interred, with appropriate fanfare, in Lee Mission Cemetery in June 1906. There are currently 3500+ documented burials in the cemetery. Over the years the cemetery has been vandalized and the victim of neglect. Various civic groups and individuals have made an effort in past years to restore and maintain the graveyard, but it has been an uphill battle. Currently, the cemetery has been receiving some of the attention that a historic site of this dimension and significance deserves. We can only hope that it will continue.